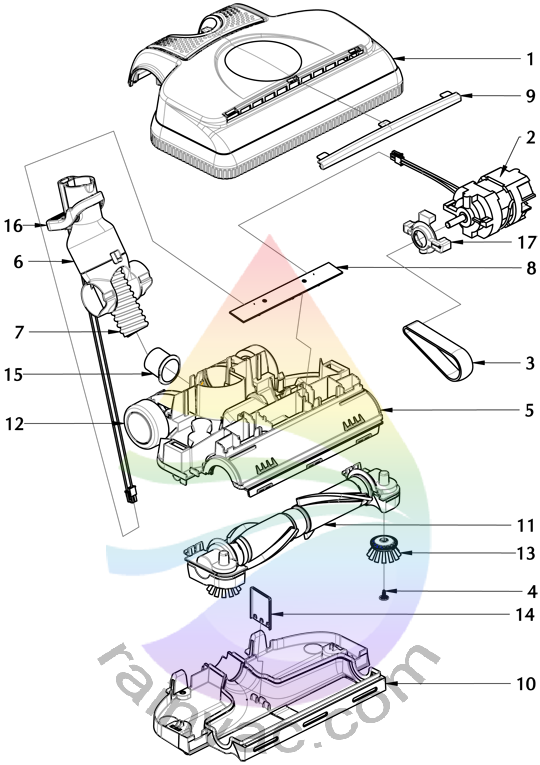 This schematic covers the complete Rainbow PN-12 power nozzle CENTER BELT version assembly that includes the motor, brush roll, and pivot arm. Effective serial number 40000001 with a start date of March 10th 2011 through serial number 40249999 (rough estimate) and an end date of September 2012 (estimate). Cover assembly for the model PN-12 power nozzle that has the center belt motor and brush roll. Effective serial number 40098280, this cover assembly now has added ribs to secure the motor from shifting during shipping and rough handling. So if your version does not have these added ribs, please understand that this is the improved design to the same part and the original part is no longer available. Factory original OEM motor assembly for the PN-12 version one power nozzle that has the belt in the center. This motor is an exact part and has a plastic cooling fan to help prevent static buildup. The second version PN-12 has the belt on the end of the brush roll so be sure to order the correct part. 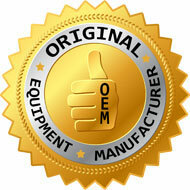 First version factory OEM belt for the center driven brush roll PN-12 power nozzle. Replace this part once per year for optimal performance. This belt fits serial number 40000001 through 40014588. If your serial number is above this, then please order part number R15127. Third version factory OEM belt for the center driven brush roll PN-12 power nozzle. Replace this part once per year for optimal performance. This belt fits serial number effective 40014589. If your serial number is below, then please order part number R15227. The motor shaft was extended and allowed for this wider belt which gives more torque and increases performance. This screw is used on PN-12 power nozzles and attaches the edge brush to the brush roll assembly. Two screws are required for assembly and can be replaced if either become lost or corroded over time. Complete manifold which includes the wheels for the model PN-12 power nozzle that has the center belt motor and brush roll. Effective serial number 40107606, the manifold now has five small slots in front of the brush roll. While maintaining the same cleaning ability and airflow, these slots improve the maneuverability on plush carpets and soft surfaces. If your version does not have the five holes, please understand that this is the improved design to the same part and the original part is no longer available. Discontinued item number R14036 may be stamped onto the lower section of this item. Pivot arm assembly for the E2 Type 12 Black series PN-12 and PN-23 power nozzle. Effective serial number 40500206 (PN-12) with a start date of April 3rd 2014, this item was improved with thinner more flexible wiring to prevent pinching and short circuit. Easy way to tell is the new improved version has one white and one black wire. Original version has two black wires. Please view image as it comes with several parts. Fits both the side belt and center belt version. Pivot arm hose for the model PN-12 power nozzle. Works with both the center belt and side belt driven version. LED light assembly for the PN-12 power nozzle. This part allows you to vacuum in the dark if you ever felt the need to. Front clear lens for the model PN-12 power nozzle. Fits both the center and side belt driven design. Easily snaps into place. Sole plate assembly for the center belt driven model PN-12 power nozzle. The other type is a side belt driven power nozzle. Please be sure you order the correct part. You may find a manufacturer number R14013 stamped onto the lower section of this item. Factory OEM brush roll for the center belt driven PN-12 power nozzle. This part is what came standard from factory. Please confirm if your belt is in the center of the brush roll or the end of the brush roll. You may find R14233 and R14234 stamped into the end of this brush roll. These numbers are on both versions of the brush roll so you can't use this as an exact reference. Brush roll including the gear box with the soft bristles for the center belt driven PN-12. Designed to help prevent your power nozzle from skipping on short pile carpet. Wheel for the PN-12 power nozzle. If these wheels get broken or damaged, then it is possible to replace. Removing and pressing a new wheel with stud is not very easy and it may be worth replacing manifold which comes with both wheels. Original edge brush assembly for the PN-12 power nozzle. This part rotates and helps kick dirt and debris into the direct path of the cleaning area from along edges and wall. The belt guard helps keep the belt on the motor shaft of your model PN-12 power nozzle center belt version. Hose collar for the PN-12 power nozzle. The hose collar connects the pivot arm hose to the manifold. Wand foot release for the PN-12 power nozzle and AM-12 Black AquaMate IV. Does not fit any previous model. For details, please download and view the schematics for confirmation. Motor mount for the center belt driven model PN-12 power nozzle. Helps reduce vibration and noise while cleaning your home.